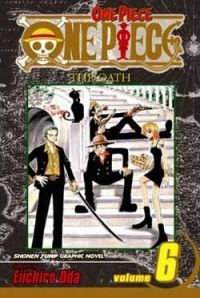 Luffy and his Straw Hat Pirates thought they were just stopping in for a quick bite...but now Luffy's been made a busboy on Baratie, the Oceangoing Restaurant, and it turns out some of the worst-mannered pirates on the Grand Line are just dying for a meal. Always one to look on the bright side, Luffy sets his sights on Sanji, the smart-talking, skirt chasing Maitre' d on the Baratie, as the new cook for his ship, the Merry Go. Sanji doesn't want to go, however, it just may take a battle between the two most dread pirate crews (not to mention a little sweet talking from Nami) to convince him to join the Straw Hats and uphold his oath to feed any and all pirates in need. The question is: what do you do when the very same pirates you just fed now want to serve you up for dinner?